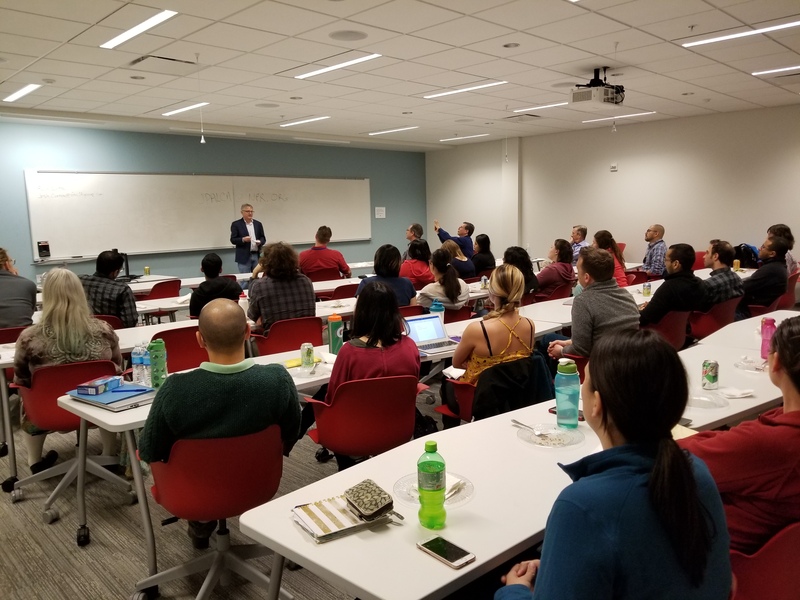 Lincoln, Neb - The Nebraska Food for Health Center (NFHC) was honored to have Joe Palca, the Science Correspondent for National Public Radio (NPR), as the guest presenter at their weekly “gut group” seminar series on March 23. Joe led a discussion on a range of topics, including how to engage the public in science issues and the role of social media on conveying science communication. After the presentation, Dr. Andy Benson, Center Director, and Dr. Bob Hutkins, Senior Faculty led Joe on a tour of the Food Innovation Center and the Gut Biology labs. Joe Palca was at UNL as part of the SciComm 2018 conference. One of the goals of this conference was to train scientists, educators, journalists and the public in effective science communication. Joe presented a plenary lecture on Science Communication at the conference, and Dr. Rick Goodman, UNL Food Science Department’s GMO expert, presented a lecture on Food Safety and Risks. On Sunday, March 25th, Joe hosted “Afternoon Science with NET and Joe Palca” at the NET Auditorium. Joe described his new NPR series Joe's Big Idea, and then interviewed Bob Hutkins and Ali Tamayol (from the College of Engineering). Bob described how microbes are responsible for fermentation and discussed the role of fermented foods on gut health. He even got Joe to give natto (sticky fermented soybeans) a try!